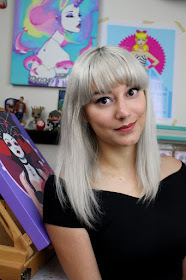 Art NuVogue: Artist Interview with Nancy V.
Hey guys! I recently did a student interview with a young aspiring artist and I thought I'd share the Q&A with you! Thanks to Nancy who contacted me for her school assignment- hope this helped! xoxo L.
1) Was your style of art always like this? And how was it developed through time? I'm not sure I even had a style until somewhat recently... at least not one I was aware of. Before art school I mostly copied the anime and manga I liked, such as "Sailor Moon." I drew hundreds of those! Haha. In art school they basically train you NOT to have a style unless it's that of the masters- or Norman Rockwell. It wasn't until my last semester at the Academy that I had any real direction at all. I went and saw a live presentation by David Downton, a prominent and accomplished fashion illustrator, and for the first time realized that there might be some work out there for someone who enjoyed drawing pretty stylized women. When I graduated I was pretty lost and confused as to where to go and what to do. I had a portfolio of mismatched pieces- from oil paintings of realistic portraits to some more illustrative digital work. Shortly there I after I began my video art blog, "Art NuVogue," in hopes of sharing my "style experiments" and discovering myself artistically- some 70 episodes later I think I've finally started to hit my stride. 2) Do you think that art should be/can be 'graded' and 'marked' on a scale of good or bad? Art should never be graded on a scale of "good or bad," but I do think art education is important and the classical techniques for composition, color theory and design are vital. Critique is very important if you want to grow and improve as an artist- that requires an instructor to tell you what needs to be improved upon. Sometimes it's difficult to tell "what went wrong" in your own work, so getting advice and guidance from a good teacher is very important if you want to become a better artist. With that said, I don't think art is as much of a talent as it is a skill. Most successful or "good" artists are that way because they practice ALOT and enjoy doing so. 3) Were you ever repressed and told that what you're doing is 'wrong'? And how did you deal with that? I can't say that I was. I've been drawing since as long as I can remember and my parents were extremely supportive of my passion and always believed I could do anything I wanted to do if I put in the hard work. I have had my fair share of "critics" along the way- many people don't believe it's possible for an artist to earn a living- which is very naive, but they still like to judge. 4) If you are a magician, with unlimited power and anything is possible, what would you make/do? Wow- big question. Not totally sure- World Peace I guess? So many people suffer constantly in the world and I would like to somehow put a stop to that. Everyone deserves some happiness. 5) Is there an exciting project that you are currently working on? How was the idea started and what is its purpose? I constantly have about a million projects in my head I want to do- but currently I have a few that should actually come to be! I'm in the brainstorming phase of preparing for a new exhibition- I was contacted by a gallery that would like to host some of my work so I'm sketching new ideas for paintings and hope to get them started soon! I'm also very excited about launching some online art courses so I can start working one on one with fans and students who want to learn more about art and illustration! 6) What does the future look like for the art industry? Do you see much change? Or do you hope for something to change/happen (such as jobs or how people are involved in the arts)? I can't say what the future looks like - but right now it's actually a great time for artists. With the incredible invention of the internet and social networking there are more ways than ever before for artists to get exposure and work without ever stepping into a gallery with a cumbersome art portfolio full of original paintings. It's a wonderful time for the DIY artists who can launch their own online stores with places like Etsy, self publish their own books and comics, and even stream live video of their painting process. The corporate art world is also very exciting and lucrative right now. With the huge surge in mobile and online games there is a ton full time and freelance work for artists and designers. 7) And lastly, if art is a journey, and you have just finished it, what do you hope to have achieved? Well, I like to think an artists work is never "finished." I hope to be holding a paint brush till my last breath and I keel over! Ha! But honestly all I hope to achieve in my journey is to enjoy my work along the way, create a few pieces that I'm proud of, and help educate others along the way.